I use a Carver PM-600 Power Amplifier through a pair of JBL L-80S speakers. I wanted a remote turn-on as well as master volume control. I also wanted to use a foot pedal volume control (I'm an old organ player) and so decided to add in a dedicated stereo VCA. I decided to use the SSM2164 'Mike Irwin" VCA board from Charlie Lamm. This VCA worked quite well so I just needed to adapt it to the MOTM power connector. I used diodes to 'or' the control voltages from the front panel control and the CV input. This allows me to set the minimum level with the front panel control and the maximum level with the CV input which is typically driven from my MOTM-850 pedal interface. This diode does drop the maximum output from the module but I have to attenuate the signal anyway for the power amp. Note: The SSM2164 quad VCA exhibits a catastrophic failure mode when the V+ pin is powered and the V- pin is disconnected (e.g. disconnected means open, not at ground potential). There is documentation on this failure mode on Neil's Webbly World page. The modification to prevent this failure is to add a schottky diode with the anode connected to pin 9 (e.g. -15 volts) and the cathode connected to ground to provide a path for current to flow the negative supply is disconnected. The On/Off function is just a +5 volt logic signal which controls the remote turn-on feature of the Carver amplifier. 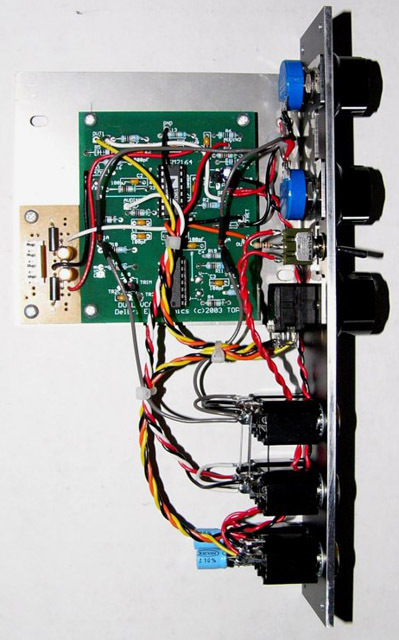 The Out R/L is capacitive coupled and the jack is stereo for a single cable interface to the amplifier. The knob is red so I can find it quickly since I am driving 600 watt amplifier! The smaller PCB is a Radio Shack perf board that has hole on 0.150 centers that line up with the MOTM-style power connector. You can also see that I AC coupled the output to the power amp on the bottom jack.